While many people express affection through hugs, the Walla Walla Sweets Rollergirls show affinity for one another by smashing into each other. Members of this all-women roller derby team, gain sisters alongside bruises and form an unconventional family that they are sometimes even closer with than their own. 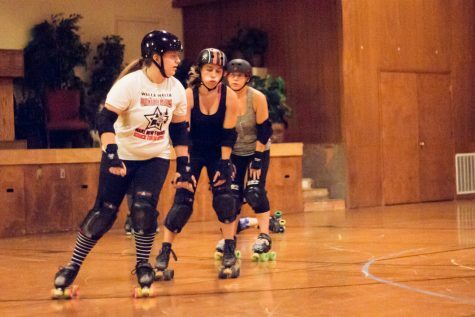 The first rollergirls skated out onto the rink in September 2009, when it was founded by Kimi “Purl Slam” Schroeder. The first “bout,” or roller derby competition took place one year later. 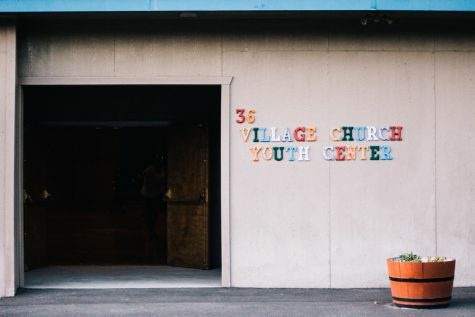 Today, the team consists of 20-25 active skaters who meet for practice on Tuesday and Thursday evenings at the Village Church Youth Center in College Place. According to Vicki “Lois Slay’n” Hillhouse, current team captain, the Sweets’ mission is to empower its members through service and competitive roller derby. As both a nonprofit organization and a sports team, the Sweets engage in frequent community service. Roller derby is a contact sport, which means that it is badass. 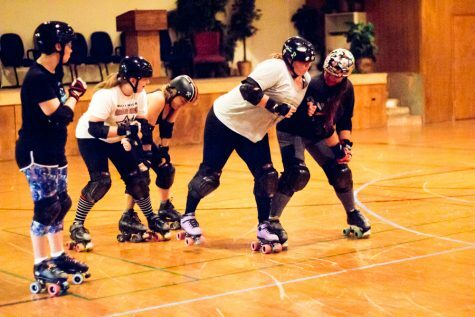 During competition, the rollergirls who aim to score points are called “jammers.” One jammer from each team jostles her way through a huge pack of “blockers” (four from each team), while skating around the 13-15 foot wide track. Nasty collisions and wipeouts are common. 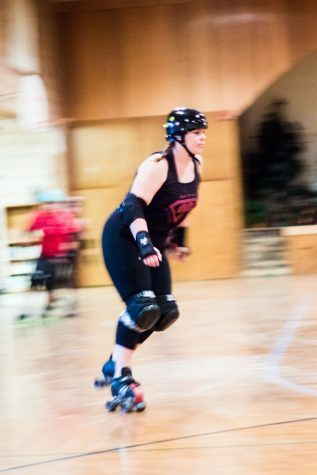 Once the jammer makes it through the horde of opponents, she scores points by passing a member of the opposite team who is skating in the same direction. 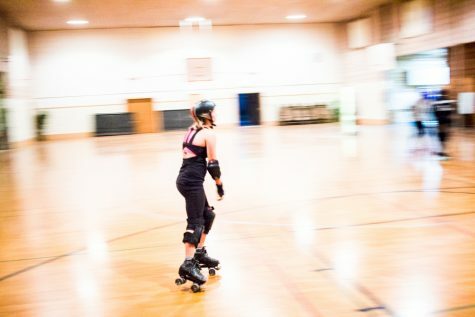 Skater Brenda “Shakedown” Wheeler, now in her seventh season, recounted her first impression of roller derby at a bout in Portland. “Right away my eyes were big as can be and I was totally hooked,” Wheeler recalled. Roller derby has that effect on people. Wheeler’s husband, who plays hockey, expressed concern about the derby skaters’ minimal safety gear and frequent falls. Wheeler, however, was undeterred. “I was in from that day on,” Wheeler said. During the day the women on the team are correctional officers, bankers, housewives, reporters and teachers. At night, when they step onto the rink, they are transformed into “Shakedown,” “Lois Slay’n,” “Theory of Hellativity” and “Allie Oops”–their skater alter egos. “Shakedown” received her name and number (0 no for ‘oh no’) as a reference to her job as a prison guard. “You get to pick your own name, but it morphs into what your team gives you,” Wheeler explained. While everyone comes from different walks of life, roller derby practices are a time to come together, decompress and let loose. Jessica Hand, a middle school math teacher, fittingly goes by “Theory of Hellativity” and the accompanying number 3.14. Hillhouse agreed that practice provides an outlet for stress. “Everything you were worried about just goes away,” Hillhouse said. Girls, meet roller derby. Roller derby, meet girls. Although new team members are known as “Fresh Meat,” it is clear that the Sweets favor cooperation rather than hierarchy. Upon asking Wheeler who is in charge of training the new skaters, Wheeler responded fervently. “Oh, we all are!” Wheeler said. She compared roller derby to a puzzle. “Not every person is made to be connected. However, without every piece of this puzzle you can never be complete,” Wheeler said. She reiterated that the Fresh Meat should not be upset if they do not find a specific clique or group because among the team, it all blends together. The Fresh Meat agreed. Hand, who has been skating for seven months, explained that her teammates are incredibly nice and supportive. She has made a lot of friends already, who act as her mentors and guide her journey as a skater. “There’s no pressure at all…they’re just happy that you’re here,” Hand stated. Alexandra “Allie Oops” Melling, who started skating this year, echoed this statement. Although the other girls are definitely competitive, she emphasized that competition is not cutthroat. “It’s not like you’re the lowest member of the pack…We all encourage each other. We compete against ourselves, not necessarily each other,” Melling said. Because Melling and Hand are Fresh Meat, they are not yet on the roster, which is their ultimate goal: only those on the roster are allowed to compete in bouts. Hand explained that the game of who can get on the roster first gives them something to work toward. At bouts, team members who do not play are formally deemed NSO (non-skating official). Rather than skate they keep score and track penalties. As NSOs, however, the girls are not allowed to show support for their team through cheering or facial expressions. It is difficult to remain outwardly neutral when they belong to such a tightly-knit community as the Sweets. Melling said she loves attending bouts and seeing her team members compete. “You get to see the skills at practice being put into place and you get a front row seat…you get to be in the action without, you know, actually getting hit,” Melling said. Within many women’s sports, there is a rigid image of what an athlete should look like: tall, skinny, and young. Like every other aspect of the sport, roller derby is unorthodox within that realm, too. According to Wheeler, roller derby destroys all traditional stereotypes, from age to height to body type. 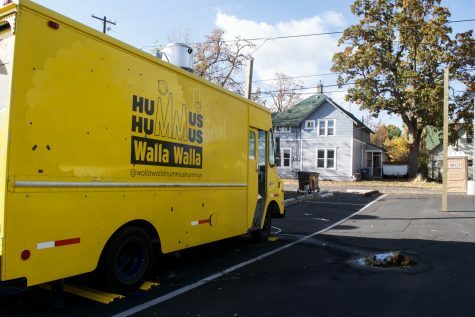 As a Walla Walla Sweet, you can do anything. No one will stop you from participating because you do not fit the mold of a typical athlete. One Sweets skater even has an insulin pump as part of her gear because she has Type 1 Diabetes. Wheeler compared roller derby to football. Both sports need people other than the cookie-cutter skinny, tall, athletic people. “You need the cornbread-fed mama hitting the table, the good eating boys, you need them in the line to block for you. You like the big-bottom girls blocking for you,” Wheeler said. The team ranges from girls in their twenties up to those in their fifties. 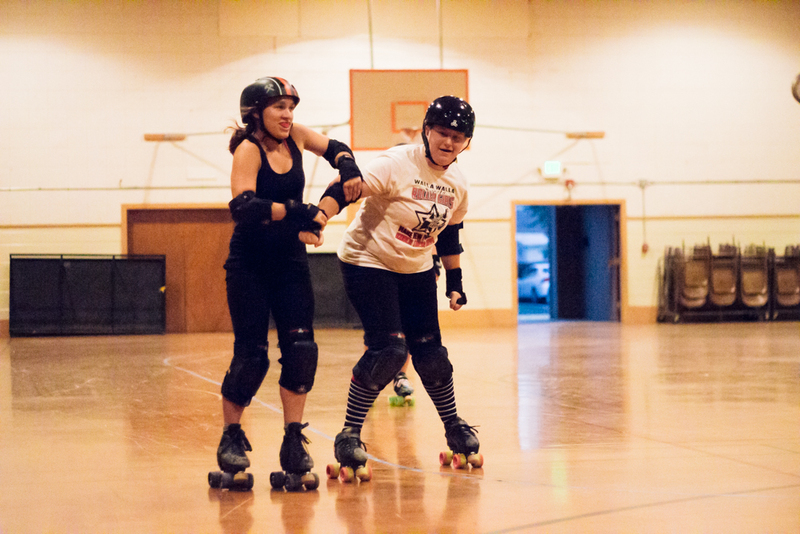 Wheeler added that roller derby has more players over the age of 40 than any other sport. Hillhouse mentioned that the Women’s Flat Track Derby Association (WFTDA) accepted a transitioning female into their association with open arms despite outside criticism. “As long as you can skate (and we can teach that, too!) and have an interest in learning, there’s generally a place for everyone in derby,” Hillhouse said. 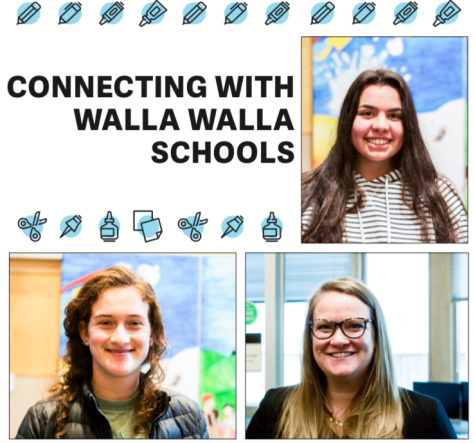 The Walla Walla Sweets are one of the most diverse, flamboyant, and interesting families you will ever meet. This community aspect inspires Wheeler to continue skating. “It’s the family. [Team members] become part of your family. When you don’t have as great family ties with your own family…this is my sisters, this is my family,” Wheeler said. When the Fresh Meat walk into their first roller derby practice, they have no idea that they are signing up for a family. “When girls come in, they don’t realize it’s just not playing roller derby. We’ve got a lot of depth to us,” said Wheeler. Although Melling only joined the team in February, she already considers the other skaters as role models. “[My teammates are] kind of my inspiration…I’d like to be that person years down the road,” Melling said. Like a family, the younger women have older women to look up to, forming a kind of sisterhood of the traveling Sweets. The Sweets combine the camaraderie and discipline of a high school sports team to produce a team of adults who might not have the opportunity to experience that sort of teamwork elsewhere. Both Wheeler and Hillhouse, two of the longest standing members of the Sweets, remarked that they had a hard time finding a sense of community and activities to bond over upon moving to Walla Walla. “Knowing people isn’t the same thing as having your tribe,” Hillhouse stated. “There’s so much positivity around this thing called roller derby. It’s so deep…you have no idea how it touches your life and affects your world and changes what a good person you can be,” Wheeler said. There is no question that the Sweets are family, but on the rink their apparently sweet demeanor is transformed into determination and intimidation. Although witnessing the team’s skill and aggression is a bit intimidating for Fresh Meat like Hand, knowing that they double as family is comforting. While time heals most wounds, roller derby creates them. Melling, who has played for almost a year, considers these wounds marks of progress. “Bruises are rewarding because I earned them,” Melling said. Since roller derby is a contact sport, the skaters cannot worry about hurting people. On the other hand, it can be difficult to let go of apprehensions about physical aggression. Wheeler considers that one of the biggest challenges of roller derby. “I love to play hard, but I don’t ever like hurting anybody. My heart swells but it also shrinks at the same time…[I] always believe that it’s not how many times you fall; it’s about how many times you get up afterwards,” Wheeler said. In the rink, competition between teams is fierce. At after-bout parties, however, opponents transition easily into friends. Wheeler said she wakes up to many Facebook friend requests the morning after these parties. “The camaraderie of the love of the game is more overwhelming than the potential nastiness that isn’t even there,” Wheeler said.